We are currently planning below sections. We are open to add additional sections. What are the proposed release dates of this magazine? 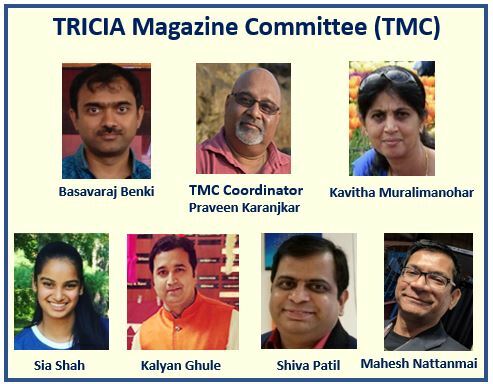 The TRICIA Magazine will be released on last Sunday of every quarter. The dates for this year 2018 are April 15, Jun 24, Sep 30 and Dec 30. What’s the language for this magazine? As of now, we are starting with only English language. What are the deadlines to submit the contents for this magazine? The deadline for submitting the content is 15th of last month of every quarter. They are March 15, Jun 15, Sept 15 and Dec 15. Your article should be max 2 pages or 1000 words. Do you publish Ads of businesses? What are the prices for Ads? Yes. You can promote your local business through our magazine. The prices for Ads are $50/- quarter page, $100/- Half page, $150/- Full page. What are the contents of this quarterly magazine? The content must be nonpolitical and nonreligious. 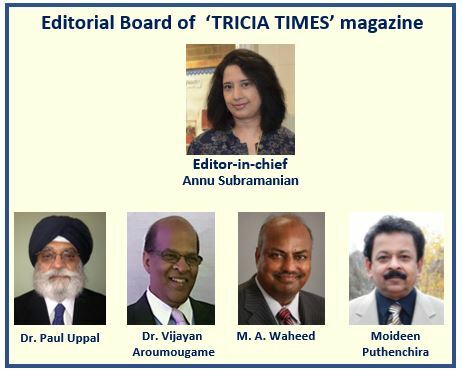 The author owns the responsibility for the content and TRICIA does not necessarily subscribe to the views expressed in the content. Please note, there is no compensation for contributing written material.